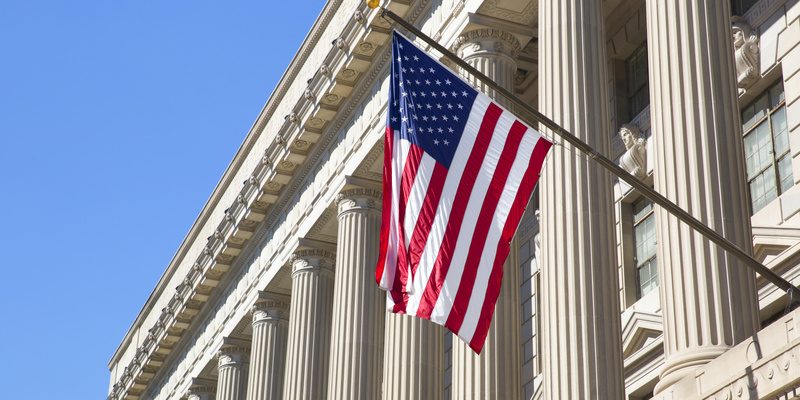 Government agencies have a significant number of challenges when it comes to working within designated budgets. 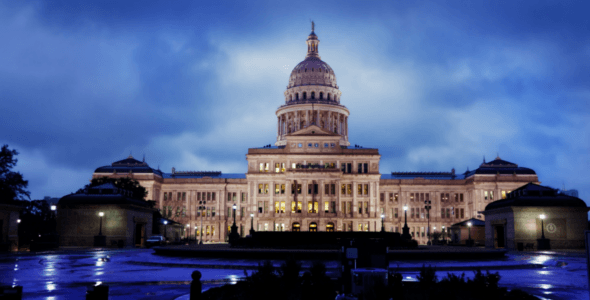 Unlike companies who can look at revenue and profit and determine that more investment in IT can be made, government agencies are provided their budgets by state or local governments and once appropriated there is really no going back to the well. However, just because there is no more money doesn’t mean IT project requests will stop or state, capital or local mandates won’t require changes to be made to online applications and services provided to the general public. In addition, special grants for IT projects have strict guidelines and processes that can elongate the development process and put projects behind schedule. Therefore, state and local government agencies, more so than even private sector companies, truly have to try and get more done with less. Sistema Technologies, Inc., a sister-company of Y&L Consulting, Inc., focuses on local and state government IT development opportunities. 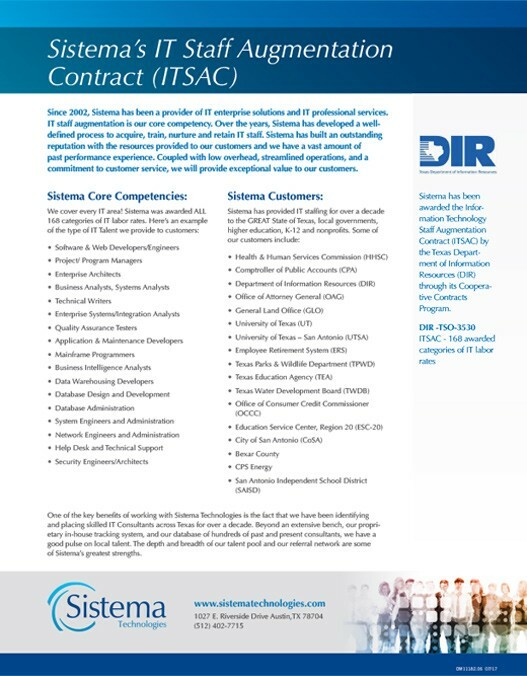 Sistema holds DIR contracts for ITSAC, DBITS and ICT. 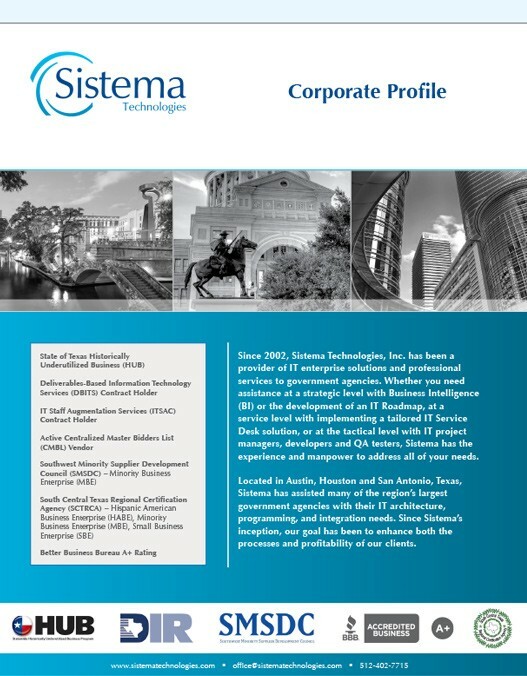 Founded in 2002, Sistema Technologies has been servicing the IT development needs of Texas-based government agencies for over a decade. 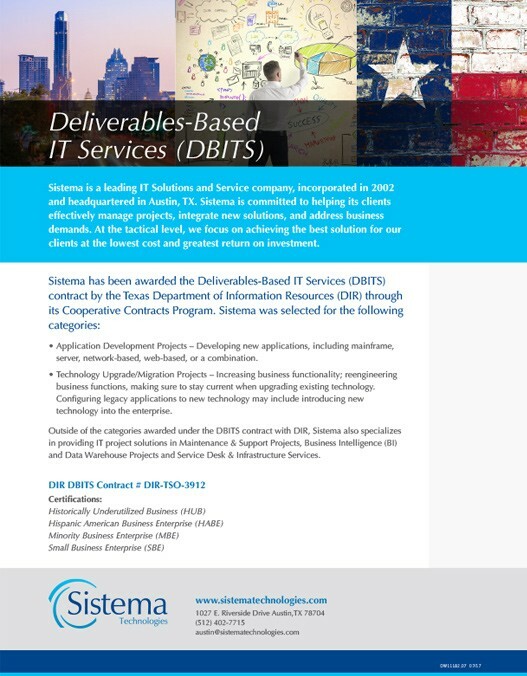 Agencies rely on Sistema to provide skilled IT talent and insightful solutions to both business and IT challenges. 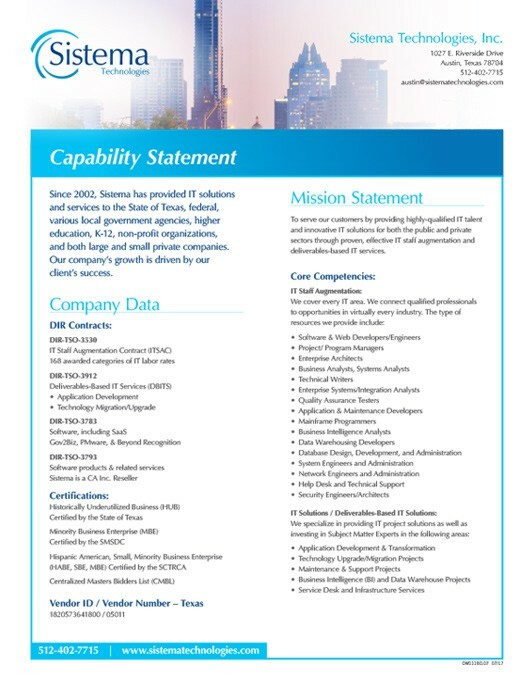 Sistema has worked for many Texas state agencies and municipalities including TX Education Agency, CoSA, HHSC, OCCC, SAWS, TX DMV, Deloitte, Accenture, ESC 20, TX Dept. of Family & Protective Services, TX Water Development Board, TX General Land Office, Bexar County, TX DOT, TX Attorney General’s Office and the Comptroller of Public Accounts (CPA).